University Singers to Perform at Carnegie Hall April 1 The group was chosen to perform, along with only three other choirs from around the nation, after a highly competitive selection process. 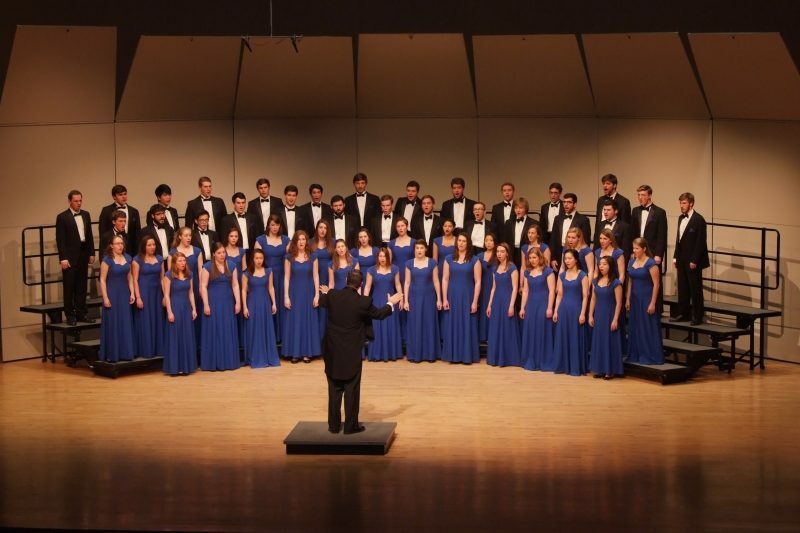 Washington and Lee University has had a strong choral tradition since its first group, the Men’s Glee Club, was established in the 19th century. But W&L choirs have not always competed on a national level. Now, thanks to hard work and solid leadership, that is beginning to change. On April 1, the Washington and Lee University Singers will take the stage for the Collegiate Choral Showcase at Carnegie Hall in New York. Earning the invitation was a highly competitive process, and the W&L group is one of only four collegiate choirs from around the country that were chosen. The Carnegie Hall news came about the same time Lynch, W&L’s director of choral activities, received word that the University Singers had been selected to perform at the American Choral Director Association’s National Conference. Because they could not do both, Lynch said, they selected the invitation that came first. But having to make the choice was “a great problem to have,” he said. To vie for a spot in the Collegiate Choral Showcase, Lynch submitted several years’ worth of recordings of the University Singers, including a couple of songs per year. He also had to submit a sample program for the concert, which will include about eight songs per group. Judges want to know that a group has the ability to sing a number of different songs well and that the quality of the choir has been sustained over the course of several years despite the annual turnover that is inevitable in any college choir. University Singers has 52 members, and about 40 to 50 percent graduate each year. Jake Burnett, a senior music major and member of University Singers, said being part of a group that is constantly striving to improve has been inspiring. “When I first arrived at Washington and Lee and I joined the Men’s Glee Club, I had no idea what I was in for with the choral program. I just thought I was going to do a little bit of singing and it would be a good time,” Burnett said. “Little did I know that the University Singers would grow over my four years to become a professional-quality choral group. In addition to being filled with people whom I am blessed to call my choir family, we get to make beautiful music together for four hours every week, travel for a week together on tour sharing that music, and receive such honors as a standing invitation to sing at the National Cathedral in Washington, D.C., being accepted (and turning down the offer) to sing at a national choral conference, and sing a full solo set in Carnegie Hall. The University Singers will be in fine company on the Perelman Stage in the Stern Auditorium at Carnegie Hall. The other three choirs that will perform that evening are the University of Louisville Cardinal Singers, the University of Washington Chamber Singers and the University of Washington Chorale.